Sound too good to be true? It’s not. Really. 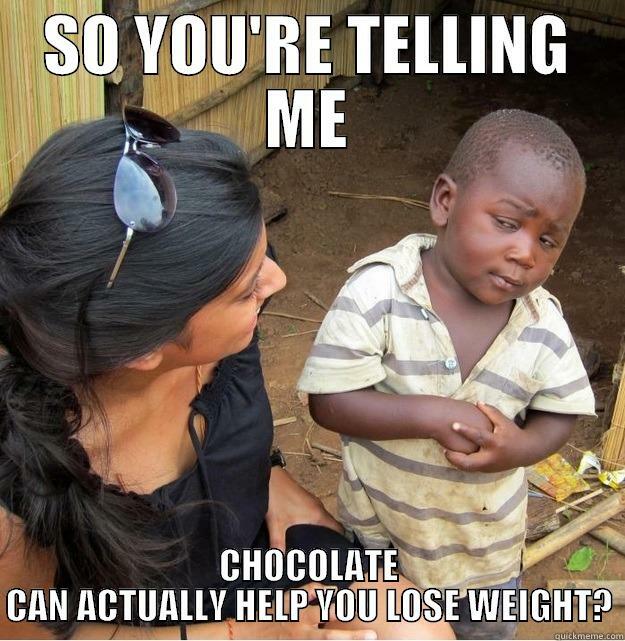 We at Mystery Chocolate Box are obviously big proponents of chocolate, so we thought we would scour the web and come up with some crazy ways that chocolate could actually help you lose weight. However, we actually ended up stumbling on some legitimate evidence that proves chocolate to be a good source of many powerful healthy nutrients — some that are even beneficial when slimming down! Now, unfortunately, we still haven’t found that one elusive scientific study that says you can eat three chocolate bars a day and still lose weight*, but this is still awesome news. Anyway, let’s explore the various ways in which chocolate helps turn your body into a fat burning machine. Insulin is one of those tricky hormones. It’s necessary for your body to function, but if it doesn’t behave correctly, it can help increase fat storage. Why? Because insulin’s job is to send blood glucose into cells. Too much insulin release over time and cells become resistant to insulin, which tricks them into thinking they’re starving. When cells think they’re starving, they signal to the body to send more food over to store as fat. Here’s where chocolate (dark chocolate, to be exact) comes into play. Studies have shown that people who ate dark chocolate instead of a more sugar-laden option like white chocolate had significantly LOWER insulin resistance (which is good!). Subjects were given either milk or dark chocolate to eat and then, two and a half hours later, they measured their level of satiety (fullness) and were told to eat as much pizza as they wanted. The group who ate dark chocolate ate 15% less pizza AND noted that their cravings for junk foods were lower than the other group. What are the two interesting points out of this study? How do you get to be a part of a study like this? Chocolate AND pizza? Dark chocolate is a powerful craving reducer and fullness inducer. Stress is not good when trying to lose weight. Why? It’s related to the first point, actually. See, stress causes your body to release cortisol, which in turn causes your body to release more insulin (which eventually leads to overeating). In a 2009 study, subjects who suffered from anxiety ate 1.4 ounces of dark chocolate (a little more than a half of a full size bar) every day for two weeks. At the end of the study, the group’s cortisol levels were decreased. So then, what are oligomeric procyanidins? Researchers have identified oligomeric procyanidins (also known as oligomeric PCs) as the most beneficial flavanol in chocolate for weight loss. What do they do? Well, the short answer is they help with #1 above — they help lower insulin resistance, which helps lower your appetite and avoid fat storage. Recently, researchers at UC San Diego found that in a sample of over 1,000 people of all genders and age ranges, the “chocolate eaters” in the group had a lower BMI (Body Mass Index), despite the fact that they didn’t exercise any more and ate slightly more calories and saturated fats than the rest of the group. Even when adjusting the data for different variables like age, gender, physical activity, and anything else, chocolate consumption was still linked to lower BMI. In a survey done on a weight loss community website, 91 percent of people who lost 10% or more of their bodyweight ate chocolate while slimming down. Hooray for dark chocolate, then. Now, you’ll notice that it’s DARK chocolate that is mentioned in all of these studies. Because these beneficial health qualities come from cacao, only dark chocolate has (1) a high enough cacao content to deliver these benefits, (2) a low enough sugar content to not negate all this good stuff, and (3) meaningful fiber content. Now this doesn’t mean you can’t eat ANY milk or white chocolate! Just view your dark chocolate as a healthy snack (as long as you keep consumption below 1.4 oz per day) and your milk/white chocolate as a sweet treat. Beyond that, we actually know about some chocolate bars with MORE fiber than sugar! Would you be interested in trying one of these bars out? Let us know and we’ll consider putting one of them in an upcoming Mystery Chocolate Box! No Replies to "How Eating Chocolate Can Help You Lose Weight"